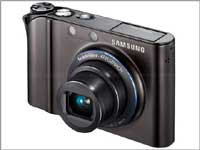 Samsung is breaking new ground with the launch of the world's highest 14.7 megapixel 28mm Wide angle lens digital camera. The Samsung NV100HD continues the style and smart functionality of the NV range and boasts impressive high definition technology. The 14.7 megapixel NV100HD enables users to record high definition videos and super sharp movie-quality recordings. The camera’s High Definition Multimedia Interface (HDMI) and Consumer Electronics Control (CEC) delivers crystal-clear images and movies via a single cable for ease of use. Users can now watch their movies and pictures on a big-screen LCD or plasma - with superior HD quality. Samsung’s Consumer Electronic Control (CEC) means that it is possible to control the NV100HD and compatible Samsung TVs with just one remote control.